Like its counterpart at City Point, Broadway Landing was a major supply depot for the Union army at Petersburg, Va. In 1864, the Civil War was raging across the United States. At the epicenter of the seemingly stalemated conflict was the vital Confederate stronghold at Petersburg, Va. As Union and Confederate forces settled in for a lengthy siege—the Confederates inside the city and the Federal troops surrounding them to the south and east—the North set up numerous supply depots as spots for offloading siege ammunition. The best known supply depot was located at City Point. However, another small town in the area also served to bring heavy artillery, ammunition, and other supplies from the James and Appomattox Rivers to the army in the field. This town was Broadway Landing, located eight miles northeast of Petersburg. 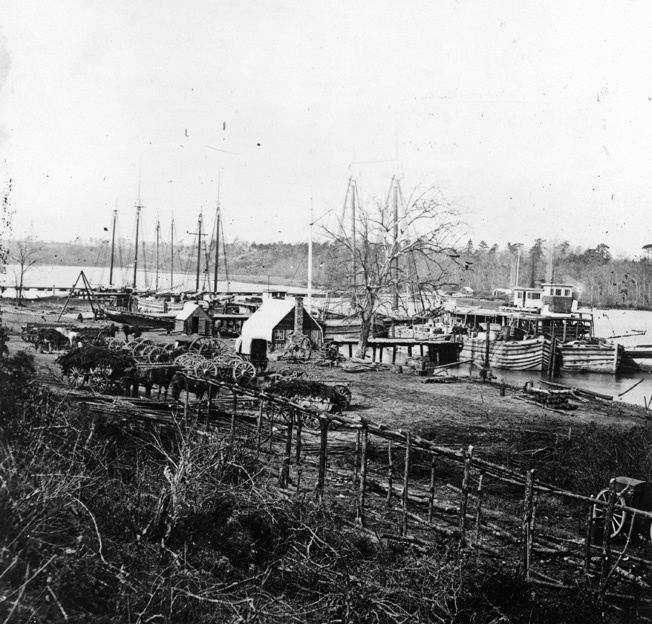 The history of Broadway Landing began soon after the establishment of the Virginia colony. A number of settlers who lived farther east explored down the James River and in 1619 established Bermuda Hundred on a peninsula between the James and Appomattox Rivers. They were the first Europeans to set foot in what would become the town of Broadway Landing. Later in the 17th century, a man named Thomas Broadway moved into the area and named his land along the Appomattox River after himself. The town he established consisted of no more than his home and a few surrounding buildings for his relatives and slaves, but it soon began to grow. It quickly became the largest town in Prince George County, and because of its size, the Virginia Assembly granted the town the right to have a ferry cross the Appomattox River at that point. This began a long tradition of Broadway Landing as a major transportation center for the area south of Richmond. When the Revolutionary War came, the British used Broadway Landing as a base for their preliminary attacks on Richmond during the 1781 campaign. After the victory of the American colonies, the Appomattox River grew in importance because of the emergence of the nearby town of Petersburg as the most important regional center of commerce. The river channel was deepened up to Broadway Landing in 1788 by an act of the Virginia legislature, and the town became the official port of Petersburg. It continued to be an important commercial center with the construction of the Munt Brick Plant. However, with the closing of the plant around 1830 and the subsequent movement of much of Petersburg’s trade to City Point, Broadway Landing began to fall into decline. By 1860, it was less a town than a tiny cluster of homes. The 1860 census reported Broadway Landing as having 8,411 people, 4,997 of them slaves, with 2,900 whites and 515 free blacks. A drawing of the area south and east of Broadway Landing from the 180-foot-high Cobb’s Signal Tower shows the Point of Rocks Bridge, the town, and its pontoon bridge. After the 1860 election of Abraham Lincoln as president and the secession of 11 Southern states, life seemed to move on normally at Broadway Landing. To the citizens of the small village, the opening shots fired in anger at Bull Run may as well have been a thousand miles away. Union Maj. Gen. George McClellan’s Peninsular Campaign in 1862 changed that misguided notion. After leaving the peninsula, Union troops passed within 15 miles of the town, and townsfolk could hear gunfire echoing across the James River. Within two years, the everyday life of every citizen of Broadway Landing would change dramatically as Union troops by the thousands entered the town and made it into a huge supply depot that would help sound the death knell of the Confederacy. After three years of devastating conflict, the Union Army was frustrated in its repeated attempts to take Richmond. The Federals had over twice as many troops as Confederate General Robert E. Lee, but the core of their problems lay with their leadership. After suffering through years of incompetent generals, President Lincoln appointed Ulysses S. Grant commander-in-chief of the Union Army in the spring of 1864. Beginning that May, Grant assumed the task of taking Richmond at all costs. His two-part strategy involved winning battles to the north and east of Richmond while also sending a group of infantry under Maj. Gen. Benjamin Butler to Bermuda Hundred. Grant’s strategy did not begin well, with his army suffering three consecutive defeats at Spotsylvania, North Anna, and Cold Harbor. Undeterred, he decided to follow Butler across the James River and ultimately invest the major stronghold and transportation hub that was keeping the Confederacy alive—Petersburg. Crossing the James and Appomattox Rivers required some preliminary exploration of the area before attacking Petersburg. Butler’s campaign at Bermuda Hundred had been costly and had accomplished very little. Except for the first death at Broadway Landing during the war (William Carroll, who drowned), there was not much action at this point within the town proper. All that was about to change. Confederate General P.G.T. Beauregard reported on May 30 that he had seen Union soldiers hastily withdrawing from the town. These were probably the last elements of Butler’s troops. However, 10 days later, Union soldiers led by Maj. Gen. Quincy Gillmore crossed the river. The final preliminary raids taking place around Broadway Landing were conducted by Brig. Gen. August Kautz, who led three cavalry forays in the month of June in the Petersburg-Bermuda Hundred area. Kautz’s June 22 raid attacked Confederate positions at Bermuda Hundred, around Petersburg, and at Broadway Landing. These raids were an important step in paving the way for the siege to come. It was apparent to townsfolk that something major was about to happen in the area. This famous photo shows mortars and other large artillery pieces on the beach below the town. By the end of June, Grant had established a number of supply depots along the James and Appomattox Rivers. The most important and largest was the sprawling City Point complex at the confluence of the two rivers. Broadway Landing was chosen as a site for a second supply depot because of the depth of the water there and its central position between City Point, Bermuda Hundred, and Petersburg. The depot was established on June 25 in the lower part of the town along the Appomattox River. One or two divisions (mostly Ohio national guardsmen and Connecticut Heavy Artillery) were permanently stationed at the depot, but many others moved through it at different points of the siege, including the 138th Ohio and the 4th New York. The most important regiment stationed at the depot was the 1st Connecticut Heavy Artillery, a division with a great deal of distinguished combat experience. Divisional headquarters was established at Broadway Landing, and Colonel Henry L. Abbot was appointed commander. Under Abbot’s watch, Broadway Landing would become a fully operational supply depot. When the depot was established, there was one wharf at Broadway Landing; eventually there would be three. There was also a laboratory on one of the wharves for combining artillery shells and gunpowder. This laboratory is shown in a number of Civil War era photographs of the landing, including one by the most famous Civil War photographer, Matthew Brady. Brady’s photograph, labeled “The Ordnance at the Depot,” shows a couple of buildings, along with guns, boats, wharves, and a pontoon bridge. Guns and shells of every kind passed through Broadway Landing on their way to the front, from Coehorn mortars to the 30-pound Parrot guns. The photo displays how extensive the weaponry was. Some 1,200 tons of ammunition passed through Broadway Landing in the month of July alone. Although not as big a contributor of arms as City Point, Broadway Landing did have one major accomplishment to show for its time—many of the materials used in the Battle of the Crater on July 30 passed through the town, including the explosives used to blast the famous hole beneath the Confederate line. Maj. Gen. Philip Sheridan, better known for his raids in the Shenandoah, created a diversionary raid to distract the Confederates from the Crater preparations massing at Broadway Landing. In all, the town served as an excellent supply depot, with goods being transported from the landing to almost any point on the various battlefields. From Bermuda Hundred to Five Forks, Union troops could take solace in the fact that they had a smooth-running supply depot behind them at Broadway Landing. Mathew Brady’s photograph of Broadway Landing was taken at the time of the Battle of the Crater. Cobb’s Hill Signal Tower and the pontoon bridge are clearly visible on th left. Although its major function was as a supply center, Broadway Landing also served as a transportation center. With 50 wagons sending supplies all over the area at any one time, it was the place to go when someone needed to hitch a ride. The wagons were laid next to the wharves on the riverbank for both supply and transportation use. Broadway Landing’s most important transportation application, however, came from its pontoon bridge across the Appomattox River, which was for a time the sole Union crossing point on the river. Another pontoon bridge just upstream was built on September 19. As proof of the proficiency of Abbot’s Union engineers, the bridge was built with 23 boats in one hour and 15 minutes. Although Abbot had warned his superiors about repairing the bridge frequently, it soon broke down when an excessively heavy cannon was brought across. After the bridge was fixed, Broadway ran smoothly as a transportation artery. Remains of the bridge pilings still dot the Appomattox River. Broadway Landing also served as the center of communication lines (it had a telegraph depot that connected Butler’s troops in Bermuda Hundred with City Point and the western battlefields). No major battles took place at the landing, but skirmishes were all around. At Port Walthall, Baylor’s Farm, and a number of other places in the area, shots were exchanged and men killed. By the end of July 1864, 32 men had been killed and 107 wounded in the areas surrounding Broadway Landing. Even with all the nearby carnage, Broadway Landing had one more challenge—protecting the Appomattox River. Grant had already laid mines in the river, but they were not enough to stop crafty Confederate ironclad commanders, whose attacks became increasingly frequent along the James and Appomattox as the South’s military condition became dire. The final act of desperation came on January 30, 1865, when a Rebel ironclad advanced as far as Broadway Landing before it was forced back by a hail of gunfire from Union gunboats. This was the last major Confederate attempt to infiltrate Petersburg. Although Broadway Landing had done its job admirably, its usefulness was coming to an end. 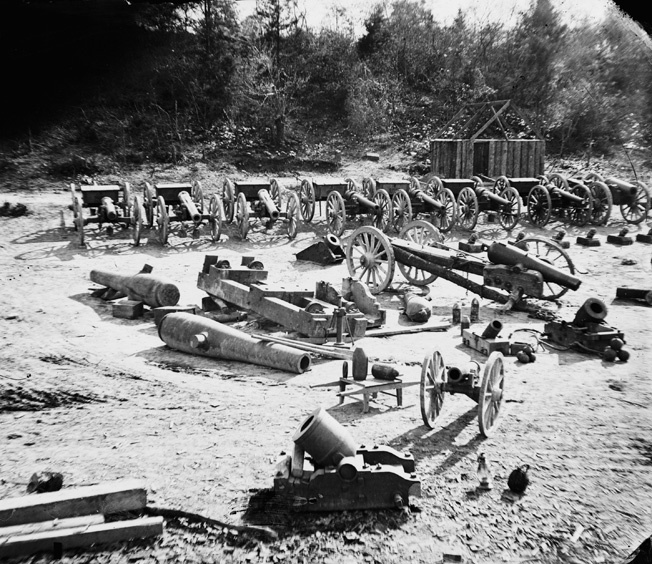 The siege depots of the Union Army had exploited the enormous advantage the Union had in supplies, and the Confederate defenders inside Petersburg were wearing down. Finally, after 10 months of hard fighting, Union soldiers broke through and took the town. On the same day that Richmond was captured by the Union troops, April 2, 1865, the siege depot at Broadway Landing ended its operation. Because the siege was over, the landing was no longer needed. The troops soon cleared out, with the last soldiers leaving on May 1 for Drewry’s Bluff. As his last act as commander of the Landing, Abbot asked Grant to keep the pontoon bridge at the landing for the townsfolk to use. Grant refused, and an 1866 map of the area shows the town and surrounding area with no surviving pontoon bridges. With the end of the war came the end of an era. The town welcomed back it long-lost citizens, but returning residents found Broadway Landing much changed from its use as a supply depot. The pontoon bridge was gone, and the church that had made Broadway Landing a major center of Prince George County was never mentioned again by any source. The town persevered into the 20th century, ceasing to exist by 1935. Today, the remains of Broadway Landing lie beneath what is now Atwater Road, on the far west of the present-day city of Hopewell. Tags Abraham Lincoln, Battle of the Crater, Broadway Landing, Confederacy, General Benjamin F. Butler, general george mcclellan, General Philip Henry Sheridan, general pierre gustave toutant beauregard, Robert E. Lee, Ulysses S. Grant, Union Army.